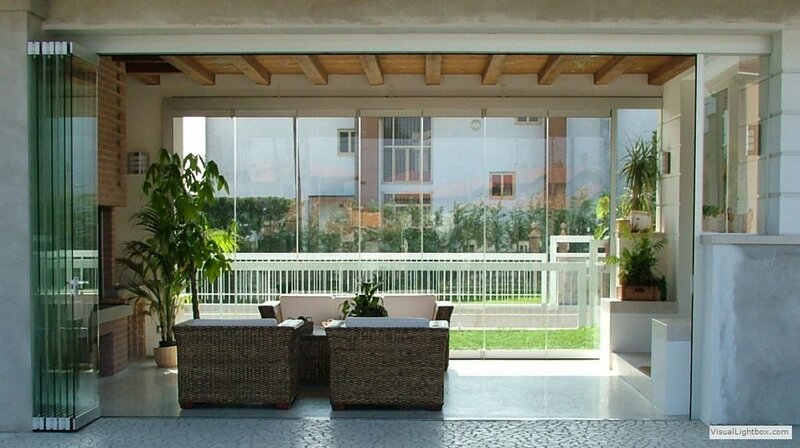 Features of the GIEMME SYSTEM all glass folding doors. What exactly are GIEMME SYSTEM folding glass doors? It’s an ideal all-glass solution custom made by our designers to close off balconies, terraces, porches, patios and gazebos. It allows you to create an extremely versatile environment and to use the surrounding space to its fullest potential. 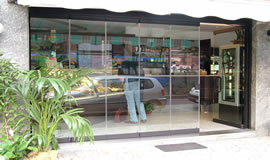 For shops, shopping centres and bars the GIEMME all-glass door SYSTEM can be used with extreme ease as it simply “disappears” with the arrival of good weather, putting a definitive end to the barrier between inside and outside. 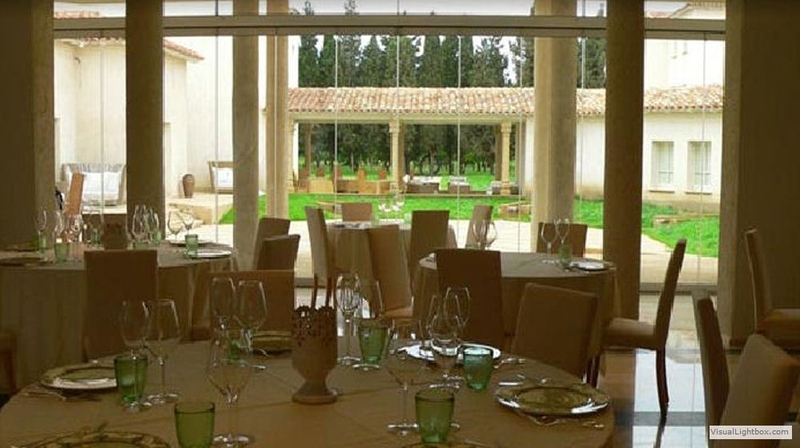 We can appreciate restaurant dining rooms much more thanks to the transparent and elegant GIEMME SYSTEM which allows you to enjoy the outside scenery even when the weather doesn’t permit you to be outdoors. Thanks to the GIEMME SYSTEM all-glass doors (which can be decorated or simple and transparent) it becomes possible to partition the interiors of private homes, offices or public places in only a few seconds but can be immediately changed back into the larger open space when necessary. One of our latest products is the GIEMME wardrobe which closes off internal spaces to create wardrobes or closets. Depending upon your needs, the practical and light sliding system allows you to open up or close off fully to your surroundings. Handling of the doors (opening or closing) can be carried out easily by a single person. The complete closure of the doors in the winter months allows exploitation of those spaces otherwise used only in the summer months and thanks to the absence of joins between the doors, you can let your gaze wander outside as if there were no barriers whilst staying comfortably inside. The full opening of the folding doors to the side and the minimum space they occupy allow you to create extremely flexible open spaces. Air tightness to atmospheric elements is ensured by the transparent polycarbonate seals between the doors and a system of EDPM seals. By collaborating with the most important and noted laboratories, GIEMME system products are constantly tried and tested to comply with standard regulations (UNI EN 14531-1: air tightness, water resistance, wind and impact resistance). Since it is a flexible, modular system, there are no width restrictions. The GIEMME SYSTEM walls can be used to surround spaces of all types and sizes. The Giemme system sliding door mechanism essentially allows you to move the doors in a straight line but the special “curved-angle” system applied to corners without mounts allows the doors to exceed even 90 degree angles. This system is particularly useful with porches and verandas where once the system is open, you can perhaps leave the corners free of any obstruction and bring the doors to your preferred position (for example against the wall of a building). The glass GIEMME SYSTEM is designed and built with the greatest attention to detail: the windows installed on balconies and terraces are equipped with a special detachable hinge system which permits you to clean the outside whilst remaining comfortably indoors. It is possible to customise the GIEMME SYSTEM. From a functional point of view one can use different types of closures or different types of accessories from the catalogue such as various floor rails, handles, door closers and locks etc. From an aesthetic point of view an infinite range of finishes can be selected in place of the aluminium and glass parts. Alternatives for the aluminium range from anodized or lacquered to a painted wood effect. Possibilities for the glass range from transparent, extra-clear, frosted or can even be personally designed. In private homes it is a flexible solution to use for terraces, porches, balconies, verandas and conservatories meanwhile providing an effective barrier against the elements. Thanks to the modular system there are no width restrictions and the doors are opened by folding up to the side. The main feature is the absence of seals between the individual panes creating a luminous all-glass effect in any environment. Ideal for hotels, restaurants, bars, pubs and clubs who want to make use of porches, terraces or other outdoor spaces throughout the entire year. The transparent or decorated GIEMME SYSTEM can partition internal spaces, homes, offices and public places into separate rooms in a short space of time whilst guaranteeing privacy and sound insulation. GM Morando introduces the GM wardrobe and the GM closet: it is possible to use the GIEMME SYSTEM to close off internal spaces which can in turn be used as wardrobes or closets. Attention to the customer’s is of the utmost importance and especially evident in GM Deco with the possibility to personalise the GIEMME SYSTEM glass. Screen printing brings a touch of class and elegance to the setting.